This volume makes writing transfer research accessible to administrators, faculty decision makers, and other stakeholders across the curriculum who have a vested interest in preparing students to succeed in their future writing tasks in academia, the workplace, and their civic lives, and offers a framework for addressing the tensions between competency-based education and the integration of knowledge so vital for our society. “Much has been made of the fact that many students enter American universities without the writing skills they will need to succeed, and universities often address these skill deficiencies early through undergraduate coursework designed to develop these writing skills. How do students understand the expectations for writing in various contexts? How can first year writing courses better prepare students for their remaining years of post-secondary education? These are just some of the questions this text seeks to address by reporting on the results of studies by 45 researchers from 28 institutions across five countries. The text is focused on the idea of writing transfer, the ability to extend one’s writing skills from one context to another, or in this case, to also transfer skills gained in writing courses to other contexts at the university. It argues that the ability to transfer these skills has an important impact on students’ ultimate writing success at a university. 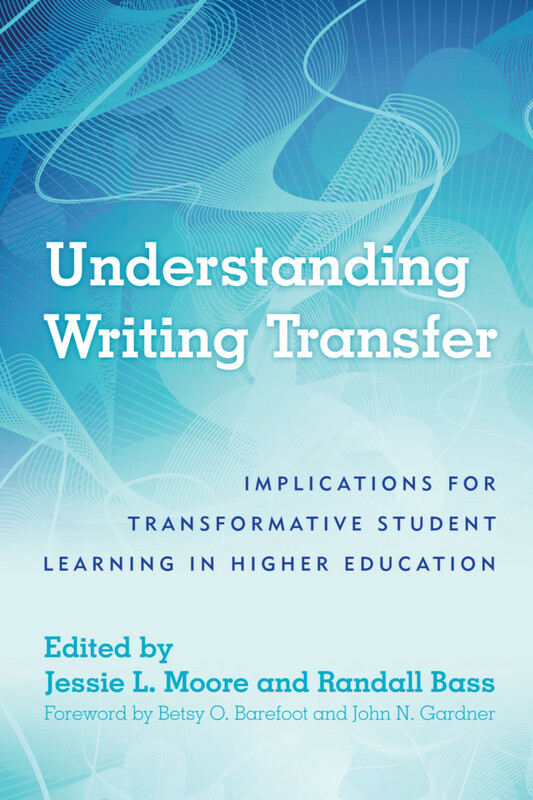 The text begins by introducing five essential principles for fostering writing transfer in higher education, and the remaining chapters are organized into two groups. Jessie L. Moore is Director of the Center for Engaged Learning and Associate Professor of English: Professional Writing & Rhetoric. She leads planning, implementation, and assessment of the Center’s research seminars, which support multi-institutional inquiry on high-impact pedagogies and other focused engaged learning topics. Her recent research examines transfer of writing knowledge and practices, multi-institutional research and collaborative inquiry, writing residencies for faculty writers, the writing lives of university students, and high-impact pedagogies. She co-edited Critical Transitions: Writing and the Question of Transfer (2016). She currently serves as the elected Secretary of the Conference on College Composition and Communication. Randall Bass is Vice Provost for Education and Professor of English at Georgetown University, where he leads the Designing the Future(s) initiative and the Red House incubator for curricular transformation. For 13 years he was the Founding Executive Director of Georgetown’s Center for New Designs in Learning and Scholarship (CNDLS). He has been working at the intersections of new media technologies and the scholarship of teaching and learning for nearly thirty years, including serving as Director and Principal Investigator of the Visible Knowledge Project, a five-year scholarship of teaching and learning project involving 70 faculty on 21 university and college campuses. In January 2009, he published a collection of essays and synthesis of findings from the Visible Knowledge Project under the title, “The Difference that Inquiry Makes,” (co-edited with Bret Eynon) in the digital journal Academic Commons (January 2009: http://academiccommons.org). Bass is the author and editor of numerous books, articles, and electronic projects, including recently, "Disrupting Ourselves: the Problem of Learning in Higher Education" (Educause Review, March/April 2012). He is currently a Senior Scholar with the American Association for Colleges and Universities.